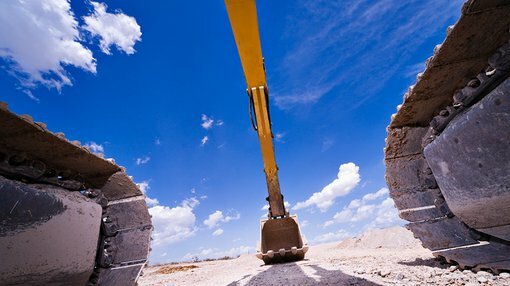 Inca Minerals (ASX: ICG) has received assays and detailed core logging data relating to drill holes RDDH-003, RDDH-004, RDDH-010 and RDDH-011. RDDH-004 is the first hole designed to test the manto sequence at Humaspunco (as well as several of the HV-series of East-West veins). 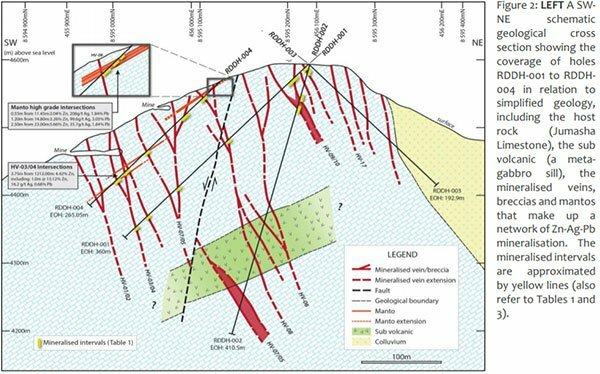 A manto sequence with a down hole thickness of approximately 15 metres from a depth of circa 11.5 metres has been identified comprising three stronger mineralised zones, including 3.04% zinc, 208 grams per tonne silver, 1.84% lead over 0.5 metres from 11.45 metres, 3.26% zinc, 99.6 grams per tonne silver, 3.05% lead over 1.2 metres from 14.8 metres and 5.66% zinc, 35.7 grams per tonne silver, 1.84% lead over 2.5 metres from 23 metres. Of course these results should be considered in line with the broader picture and as ICG is an early stage company, investors should seek professional financial advice when considering this stock for their portfolio. The following diagram indicates the areas where ICG has been drilling, including earlier holes, RDDH-001 and RDDH-02. RDDH-010 and RDDH-011 were the first holes designed to test the Callancocha Structure that traverses Humaspunco. A broad zone of mineralisation with a down hole thickness of 67.1 metres from a depth of 7.9 metres was identified in RDDH-010 comprising higher grade zones, including 5.59% zinc, 110 grams per tonne silver, 4.98% lead over 0.9 metres from 33.45 metres (RDDH-010) and 3.27% zinc, 38.4 grams per tonne silver, 3.24% lead over 0.6 metres from 97 metres (RDDH-011). The following diagram is a geological cross-section showing the coverage of holes RDDH-010 and RDDH-011. Commenting on the encouraging nature of these developments, ICG’s Managing Director, Mr Ross Brown said, “Recent drilling has confirmed that both the manto and the Callancocha Structure host significant mineralisation, both of which are very substantial mineralised targets”. He also noted that the manto is recorded along the perimeter of Humaspunco Hill, which covers an area of about 1.2 kilometres by 800 metres. 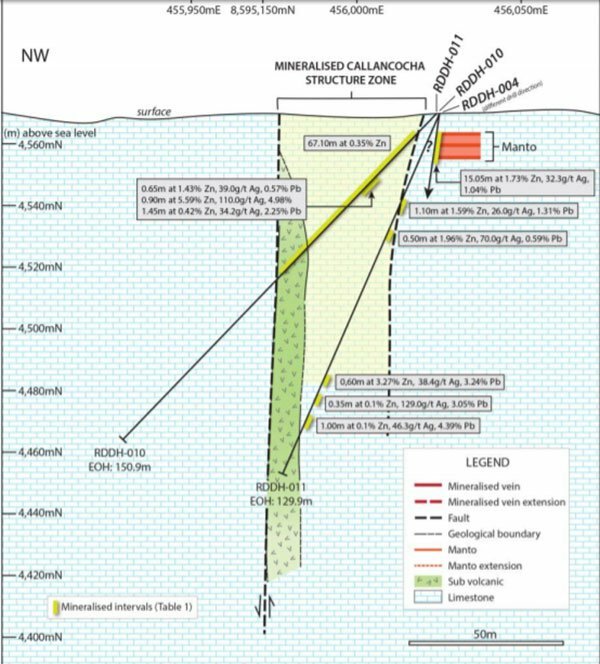 The Callancocha Structure is 800 metres long at Humaspunco, but as demonstrated by recent drilling, it extends several kilometres to the south-west as far as the new Colina Roja Prospect. Important takeaways from these recent developments are that there is significant manto mineralisation and structure-hosted disseminated-style mineralisation at Humaspunco. 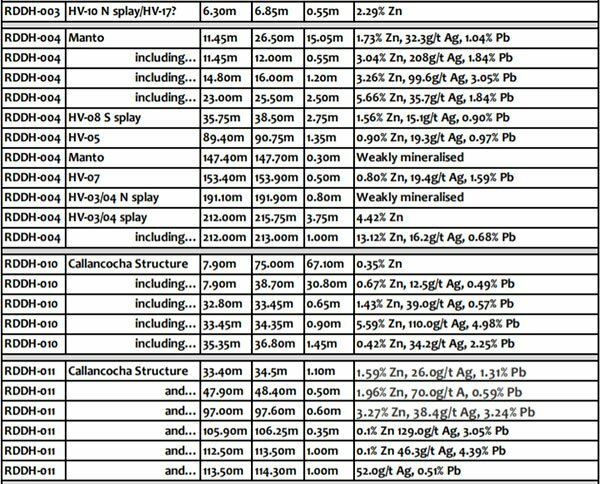 Mineralised intervals from more recent drill holes completed at Humaspunco are listed below. In addition to strong manto mineralisation, RDDH-004 also intersected all targeted veins with the majority hosting zinc-silver-lead mineralisation. The strongest mineralised vein had grades of 4.4% zinc over 3.75 metres with a peak zinc value of 13.1% over 1 metre. Consequently, the manto at Humaspunco constitutes a very large exploration target that occurs at a shallow depth below the surface over a large projected area defined by Humaspunco Hill. The second stage of the phase 1 drilling campaign has recently commenced, beginning with RDDH-012. This sub program is designed to continue the process of drill testing targets generated in surface exploration. Specific target areas include a zone of the intense workings in the north-east corner of Humaspunco. Holes will test several veins and manto occurrences. In addition, the sub program will follow up on earlier drilling results, including manto and Callancocha Structure mineralisation, as well as the high grade vein at Uchpanga.